Migros Bank, Wells Fargo and Barclays are all financial institutions that may follow you on Twitter. If we believe the experts, it is all about giving customers the information they need, when they need it, wherever the are, through whatever channel they prefer. I recently received a client survey in the mail from my bank. Below are some insights I gained from this experience and how they apply to Bank of America, Deutsche Bank, Bank of Montreal and others. Migros Bank – love thy customer? The scales have no mid-point, forcing respondents to choose a negative or positive answer even though they may be undecided. The scales contain too many choices, even though researchers have repeatedly shown that people cannot distinguish well beyond eight. Some categories are confusing, such as under 20 percent, and 21 to 40 percent. But where is the box for 20 to 21 percent? Important variables are missing for categorizing responses, making response-bias a real risk. For instance, people with a primary language other than that of the survey (German) might not have responded in large numbers due to lack of understanding. If they had, what are the chances their responses would have been different than those received? Don’t forget! 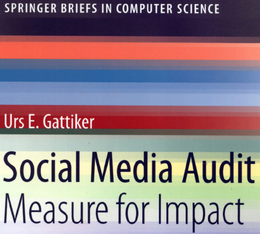 Benchmark your blog – measure for impact – use My.ComMetrics.com and improve your blog’s performance. 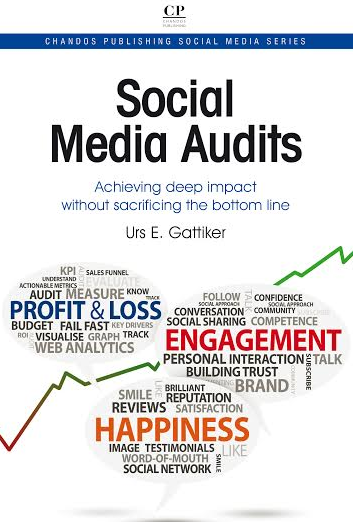 CyTRAP Labs can help you improve your social media efforts. Start a conversation! Email us at info [at] CyTRAP [dot] eu or call us at +41 (0)44-272-1876. For those who are interested – download the Migros Bank customer survey. Offering an online survey when Web 2.0 issues, such as e-banking, are addressed. Making a survey confidential instead of anonymous to enable follow-up, easily doubling your response rate. Asking people to spend 15-30 minutes (the time it takes to check the right boxes AND fill in the open-ended questions) is one thing, but considering banks charge fees for EVERYTHING, a small token of appreciation is the least they can do for clients’ honest feedback, further improving response rate. those who are very dissatisfied (research says these people tend to share their dissatisfaction with nine to ten people). As a result, those with neither a negative nor highly positive attitude towards the bank and its service culture are unlikely to reply. But they are the ones you really want to hear from, not least because they make up the largest group of customers. They may also have important suggestions that are easily and cheaply implemented to further improve service. Tip: To find out more about the tips and tricks we provide on this blog about customer relationship management include the words CyTRAP and ComMetrics in your search. Client feedback is a good way to find out how things can be improved quickly, but if you hire a polling firm, ensure they follow best practice. While Twitter and Facebook are great tools to serve your clients better, they also present a risk that the most vocal complaints get resolved first, while quieter customers are left behind. However you address questions and complaints, manage the process right. For instance, sending a question to the City of Zurich triggers an automated response email. But we had to send our question again when no answer came for two weeks. A week after that, we got a reply without an apology or a solution. This can be handled differently, such as responding to clients who fill out contact forms within 30 minutes by phone, doing something similar via Twitter, or sending your clients a survey like Migros Bank did. Use a properly-designed customer survey: If you use a pollster, ensure you can trust their data. Migros Bank will get invalid data – a dangerous foundation for strategic decision-making. Manage the process correctly: If you use Twitter, remember when people come to you. 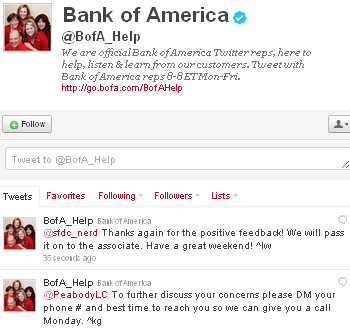 @BofA_Help is a great service, but remember to keep it going Sundays and evenings, when many people do online banking. Time is of the essence: People do not want to wait. Jura Coffee Machines rocks, because their process gets clients competent help fast. Follow up, and YES, an apology can do wonders: Ensure that whoever you tap to assist a client does it fast. If you are late, start with an apology and if you don’t understand, pick up the phone and ask the client for clarification – sitting around will not do. Sometimes social media experts brag a bit too much about what they can do to improve your customer relationship management (CRM) efforts. Take these things with a grain of salt and regardless of a request’s method of transit, be competent and courteous while answering as fast as possible with a viable solution. Just one question I hope you will answer: When did you last get great service? Good ideas for think about before sending out customer surveys! The last time I had great customer service? Every time I call or visit the US – staff are just more friendly, cheerful and helpful. They seem to actually enjoy their jobs! Thanks so much for the input. Yes customer service in the US or Canada seems to be different. I remember years ago that Sears had this lifetime warranty what was unheard of in Europe. Nevertheless, like in Europe US banks have started to charge for everything and anything. Bank of America announced just about a week ago its plans to charge a $5 monthly fee for its debit-card users (regardless how often the card is used), joining a number of other banks. So when a bank asks me to answer regarding their customer service I want to reply but as the example showed, things might go wrong because of failing to design thins properly. Thanks for sharing and I hope your bank excels when it comes to service. "…or do I even like it in the First Place?!" "Or do I like that in the First Place?!"